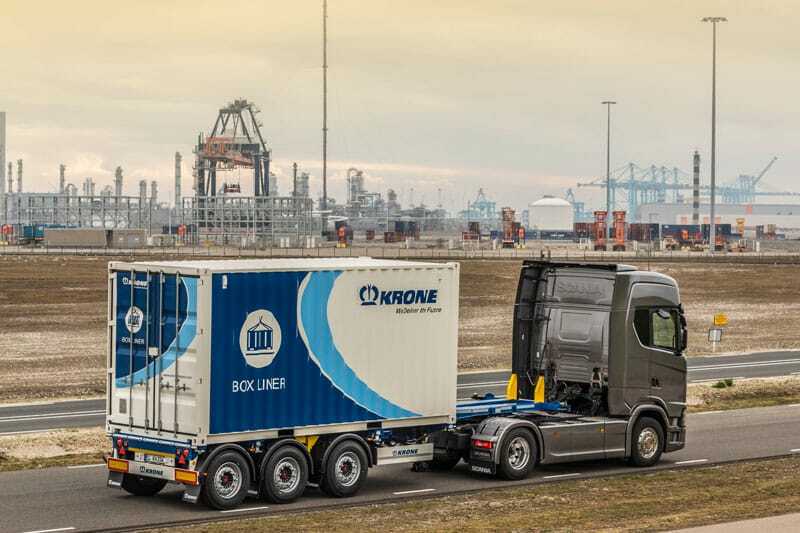 Box Liners are offered by Krone in reaction to recently released SOLAS regulations. Krone supports container traffic with containers compliant with rules that apply for weights and dimensions. Various Krone Box Liners give added value to the customer: gooseneck, flat chassis, short and long versions for 20 ft. containers as well as universal chassis for all containers sized 20 ft. to 45 ft. including short and long tunnel or without. Krone engineers improved load distribution as well as payload of the short container chassis, named Krone Box-Liner SDC27 eL20. When shipping 20 ft. containers, payload is the key priority. The distance between the wheel center of rear axle and rear twistlock was 700 to 900 millimeters when loading flush from rear-side. This was the distance requested by law as an underride guard. Now this deformation zone has been redesigned. As a result, the container box was moved forward on the vehicle chassis by approx. 20 cm. This change offers the following advantages: The semitrailer pressure increases (approx. one ton) and traction improves. Instead of 27 tons payload the 20 ft. container offers up to 28 tons in standard road traffic. Up to 32 tons cargo are possible within pre- and post-rail hauls of intermodal transport with 44 tons gross vehicle weight. The compact rear end designed by Krone sets the trailer mass to the front towards the vehicle centre. This is a principle that will become the norm: a shorter chassis used in favour of better load distribution. The shift of the gravity center optimizes axle and trailer pressure for road checks. This means added value to the shipper: less trouble with fines in case of controls and more profit through improved payload. Within the Box Liner family the multifunctional container chassis SDC 27 eLTU70 will be equipped with a compact rear. The redesigned vehicle is made for containers sized 20 ft. to 45 ft. It is built in a modular way and is easy to use. Furthermore, the payload has been improved. The tare weight of the chassis SDC 27 eLTU70 is 500 to 900 kilograms lighter, depending on the type of beams and side rails. The new rear design allows the centre of gravity to be moved forward some 200 millimeters. As per the short chassis version, the forward position of gravity centre improves trailer handling and traction. That makes it compliant and releases the third axle. It also increases the payload from 24 to 28 tons which is always a critical factor when shipping 20 ft. containers especially in intermodal combined traffic. The SDC 27 eLTU 70 multi-function chassis has been improved in comparison to the competition models, especially the handling of the front beam at the front extension. Vehicle-mounted elements exclude losses and lock the shipping containers to be transported with or without a tunnel. Converting or adjusting the chassis from rear end transportation towards middle position and extra-large sizes is much easier now: two 20 ft. containers can be carried on the same wheelbase as a 40 ft. container. The Krone Box-Liner SDC 27 eLTU6 is innovative and flexible. This all-purpose vehicle transports 20-ft. containers with an optimum load distribution in the center. They can be pushed into the rear flush position for loading and unloading. This ensures that at least 25% of the load is on the drive axle even in the case of heavy 20 ft. containers in cross-border traffic. The Box Liner TU6 is ideally suited for transporting 20 to 45 ft. containers. The Box Liner SDC 27 eLTU5 Plus is the rugged all-rounder in the family of Krone container chassis. The TU5 transports all container sizes from 20 to 45 ft. The new folding locks and the advanced easy-to-open front release offer easy handling for safe container transport. The rear extension is also pneumatically operated by the push of a button. Laws and regulations are like guard rails which help to protect companies and contribute to their success. If the rules become more stringent, the container transporter must react flexibly. Previously, there was time for a chassis change between two transport orders. Today, the transfer of empty containers can be avoided by the use of universal chassis. Since the introduction of the SOLAS regulation in July 2016, SOLAS (Safety of Life at Sea) states that the shipper will have to pay the gross weight to the shipowner in time (approximately 24 to 48 hours before the ship arrives in the port of loading) ("Verified Gross Mass" = VGM) for the packed container. Overweight is a major issue, especially for containers. Professional hauliers, however, have long recognized the importance of a weight-oriented transport style. They face the challenge of complying with the country-specific maximum dimensions and weights of trucks and semi-trailers. This is the only way to avoid expensive punitive payments and time losses. The Krone-Group (annual sales 1.6 billion €) comprises the business units of agricultural machinery and commercial trailers. The company, which was founded in 1906, is today in its fourth generation of ownership in the family Krone. The mainstay of sales of the Group is the commercial trailer (approx. 1.1 billion €). At the production sites in Werlte, Herzlake, Lübtheen, Dinklage and Tire (TR) curtainsiders and insulated & dry freight semi-trailers, container-chassis, carrier systems, trailers and superstructures as well as CEP-vehicles are produced. In addition to its products, Krone also offers a comprehensive service package, with e.g. Telematics, Finance, vehicles for rent and the marketing of used vehicles. The Krone Trailer Axle and the All-in-Krone service offering also ensure that, in case of everyday enquiries, the customer only needs to contact one person to be assured of reliable service.